Microchip’s LAN9252 is a 2/3-port EtherCAT slave controller with dual integrated Ethernet PHYs which each contain a full-duplex 100BASE-TX transceiver and support 100Mbps (100BASE-TX) operation. The LAN9252 supports HP Auto-MDIX, allowing the use of direct connect or cross-over LAN cables. 100BASE-FX is supported via an external fiber transceiver. This device provides system developers a cost-effective solution for realizing EtherCAT slaves solutions. The LAN9252 includes a 3 port EtherCAT slave controller with 4K bytes of Dual Port memory (DPRAM), 4 SyncManagers, 3 Fieldbus Memory Management Units (FMMUs) and a 64-bit Distributed Clock. It supports 4 Process Data Interfaces - SPI/SQI, HBI and a 16 Bit Digital IO. SPI and SQI (high speed SPI) provide a low pin count synchronous slave interface that facilitates communication between the device and a host system. Whereas, the Host Bus Interface facilitates the same via a high-speed asynchronous slave interface. For simple digital modules without micro-controllers, the LAN9252 can also operate in Digital I/O Mode where 16 digital signals can be controlled or monitored by the EtherCAT master. 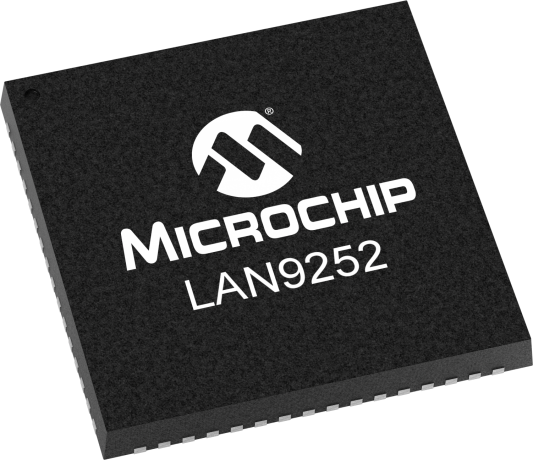 The LAN9252 can also be configured to operate via a single 3.3V supply utilizing an integrated 3.3V to1.2V linear regulator. The internal linear regulator may also be disabled, allowing usage of a high efficiency external regulator for lower system power dissipation. The LAN9252 is available in commercial, industrial and extended industrial temperature ranges and comes in either a 64 pin QFN or a 64 pin QFP-EP. EVB-LAN9252-ADD-ON is designed to be used as an add-on board (ESC board) with the Beckhoff EL9800 EtherCAT evaluation Board. This board supports the SPI and DIGIO PDI modes of the LAN9252 . EVB-LAN9252-HBIPLUS is a progression from the original EVB-LAN9252-HBI board which allows evaluation of the LAN9252 device with an attached microcontroller. EVB-LAN9252-PICtail™ Add-On Board is used for evaluating Microchip Technology’s LAN9252, a 2/3-port EtherCAT® slave controller with dual integrated Ethernet PHYs. It is an expansion board compatible with Explorer 16 development platform. This project is an Applications Example showing: EtherCAT P slave, BLDC Motor control and serial communications. The Software development kit for EVB-LAN9252-PICtail . The Software Development Kit for the EVB-LAN9252-ADD-ON Board .